The holidays are a busy time of year! Gift-wrapping, decorating, cooking, friends and family gatherings are enough to keep us more than preoccupied! Through all this chaos, it’s important to remember our pets. Here are some holiday pet safety tips! Ribbons, wrapping paper, ornaments, tinsel, extension cords and gifts may be appealing “chew toys” that may make your pet sick. There is something about those shiny strands of Christmas tree decor, which drives kitties wild. 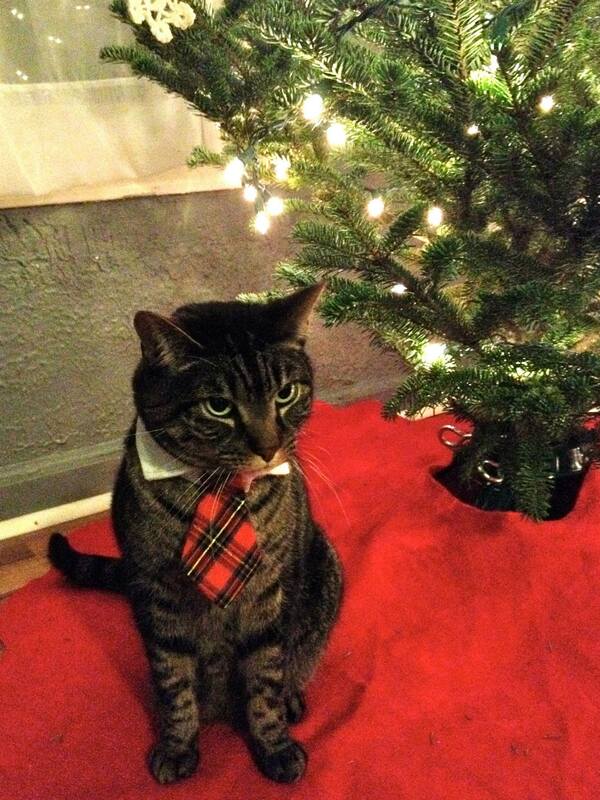 Although the sight of your cat pawing at the tree may be cute, the ingestion of tinsel can be dangerous! If strings get caught in the intestine it can mean big trouble for your pet and a trip to the vet. Keep these types of decorations out the kitty’s reach to be safe. Also consider lights and electrical cords. Make sure you are using three pronged grounding systems whenever possible. Poinsettias fill homes with color during the holidays, and in the past, have received bad publicity. In fact, poinsettias are not very toxic to pets. They do contain a milky sap that can irritate the mouth, but if signs develop, they are usually mild. Mistletoe can be toxic to animals, and you should immediately seek veterinary care if your pet has ingested any part of the plant. Mistletoe can result in vomiting, severe diarrhea, difficult breathing, shock and death within hours of ingestion. There are various species of Holly (genus Ilex) Berries and leaves can pose a problem, although signs of poisonings are generally mild, and can include vomiting, belly pain, and diarrhea. Some pets may appreciate extra attention from friends and relatives, while others may seek solitude in their favorite hiding spot. Give your pet “personal space” if they want to get away from the commotion. Some pets may change behavior in response to holiday festivities including bad behaviors including inappropriate urination. It is advisable to spend extra quality time with your pet to assure them they have not been forgotten. More pets get lost around the holidays than every other time of year. Make sure when visitors are entering and exiting, that your pet does not slip out too! Set ground rules with visitors who are making a prolonged stay, so pets and humans (especially kids) know what to expect. Even though they have their own water bowl, there is something enticing about a novel source of water; whether it’s the toilet bowl or the Christmas tree stand. If you add chemicals to the water meant to keep your tree fresh longer, be sure to read the label to make sure it is safe for pets. It’s hard to imagine the holidays without boxes of chocolate and warm cocoa in front of the fire! Keep in mind, chocolate can be toxic or even fatal to dogs and cats. Chocolate may mistakenly be given to pets as treats, and may be irresistible. Sometimes, sharing holiday foods with pets can cause pets to develop a stomach upset or worse, pancreatitis (inflammation of the pancreas) which can be caused by eating fatty foods. Keep an eye out for foods your guests may be feeding your pet. Guests may be tempted to give your pet treats. To control excessive food intake, leave out the treats your pets would normally receive, and let your guests “treat” the pets. To be festive, mix some of your pet’s regular food with water (or used canned food) make “dough,” roll out and cut into festive shapes, then bake until crunchy. Make sure that you are taking the necessary precautions around the holidays to make sure that your celebration doesn’t end in a visit to the veterinarian!